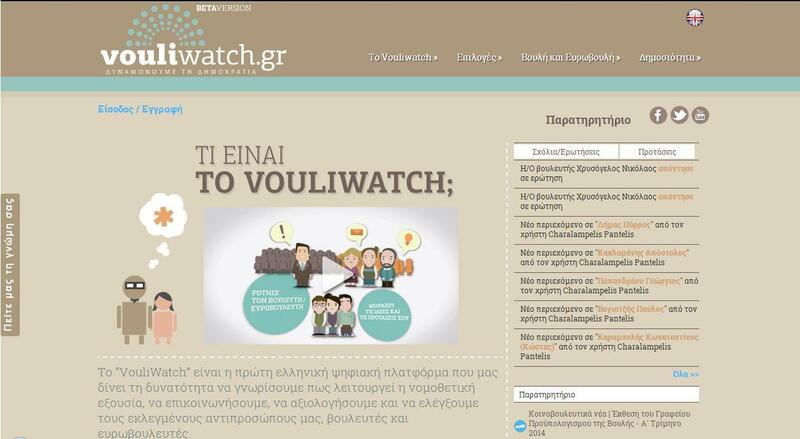 The digital’s platform main aim is to “promote public dialogue, knowledge, political participation and accountability between citizens and politicians” (Vouliwatch.gr), which will be achieved by offering to the users three options. The users can ask questions and receive replies from the representatives in the Parliament, they can promote their own ideas by making proposals, share their experiences and they can also participate on debates where the “issue of the month” will be discussed. Although Greece is worldwide known as the birthplace of democracy, due to deeply established norms, Greek citizens are not used to directly question MPs; and similarly MPs to answer openly, about hot topics that are in the limelight. Vouliwatch.gr is an attempt to bring people; especially the younger generation which has lost faith to the efficacy of the institutions, closer to their representatives. Until recently, crowdsourcing was applied by companies to many tasks, one of which is innovation. According to Majchrzak and Malhotra (2013), innovation in a crowdsourcing context is defined as the public generation of innovative solutions to a complex problem posed by the company. What if in our case the problem is a current affair, a national conflict, a local issue or even the constitution itself and the company is the legislative/executive power? Is it within the realms of reality to hope that through platforms such as Vouliwatch.gr, politics will move towards more innovative ways? There is only one basic ingredient en route to a successful implementation of this innovative effort; the acceptance and active involvement of both parties. The citizens must be willing to contribute by offering their suggestions, publicizing their opinions and expressing their concerns. Similarly, the elected representatives should ensure the transparency of their actions, evaluate with honesty the suggestions and when applied implement them. A successful implementation of a crowdsourcing action in politics is when Iceland decided to update its constitution by engaging the citizens themselves. After a process that lasted 10 months, where the citizens through social media offered feedback, the world’s first crowdsourced constitution (Farmer, 2013) became a reality. Maybe, for the Greek political landscape an action such as the crowdsourced constitution resembles more of a script from a sci-fi movie than anything feasible. However, the same could be argued a few years back for a platform such as Vouliwatch.gr. The world is not static and Greece even if as a country has the tendency to cling to its past, is forced to move forward. On the other hand, whether the introduction of Vouliwatch.gr is the first step towards a more innovative political scene, it remains to be seen. Farmer, L., (February 2013), Iceland Writes the World’s 1st Crowdsourced Constitution, Retrieved on 2 May, 2014. Giannarou, L., (2014, April 5). Η ελληνική Βουλή… χωρίς μυστικά. Καθημερινή. Retrieved on 1 May, 2014. Majchrzak, A., and Malhotra A., (2013). Towards an information systems perspective and research agenda on crowdsourcing for innovation, Journal of Strategic Information Systems. Previous PostEverpix versus Snapchat – To pay or not to payNext PostSelling your products to Justin Bieber? No way!